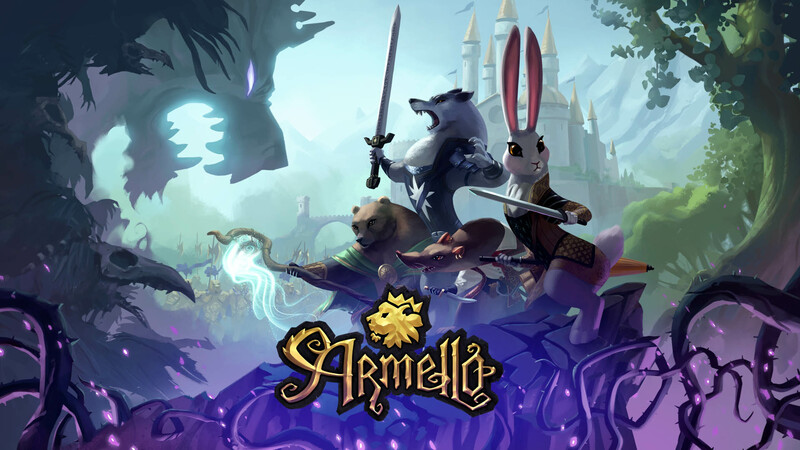 Armello, from developer League of Geeks, is a digital board game about Game of Thrones level political intrigue with character roles filled in by somewhat anthropomorphic animals. You play as one of eight characters, each with their own unique traits that help them out in special ways. Your goal is to try an become the next king in one of a few different ways and none of the supposed allies you are going against are actually your friends. This virtual board game has been released for almost every console and now it has just been released for the Nintendo Switch. Armello is a title that may seem daunting at first due to how many rules there are to learn. Fortunately, there’s a fantastic tutorial in-game that not only provides you with some story and context but also teaches you the mechanics very well. The story is fairly simple with the king of Armello having been infected by some magical disease known as Rot. He’s essentially going crazy and bringing terror, ruin, and tortured beasts to his once peaceful lands. The players, each playing their own hero, are trying to become the next king and restore peace. You can play single-round games solo against AI or you can play online within a match of up to four players. As stated previously, there are many rules and it would do this review a disservice by delving too deeply into the rules, but I will tell you the basics. There are three main ways to win: you can either kill the king without dying yourself, you can have the highest prestige score when the king dies, or you can gather four magical rocks and use the rocks to banish the king. I appreciated the multiple ways to set yourself up for victory and there are plenty of numbers and stats scattered around Armello’s rules and mechanics that all effect some facet of the gameplay. Some stats give you a higher card hand size, while some allow for more mana and some give you more dice to roll in combat. Thankfully, because this is a digital title, everything you do is chronicled, as well as handling the movements and decisions of NPC factions. This very well could have been a physical board game, but I don’t think it would have been anywhere near as fun due to how many systems are kept track of. Turns go in day and night cycles, so everyone can do something during the day and then get to perform actions at night. The king loses one hit point every dawn due to the Rot that’s infecting him, so the longest a match can take is about 18 turns. It may seem like a long game, but in practice, you’re usually taking about 30-40 minutes per match, which is the standard amount of time usually for more tactical board games. The tactical aspect of Armello requires you to manage combat, survive dungeon runs, and even take a riskier option to complete a quest. Every action is performed with die and requires a great amount of chance, but there are possibilities to improve your odds. In combat or challenges, you can burn cards in your hand lock in one of your die in a certain role. You can improve your stats to have better odds on dangerous quest branches. On the topic of cards, there are three main varieties of cards that can be played in Armello consisting of Items, Spells, and Trickery. Items will mainly be pieces of equipment to improve rolls, Spells can be used to heal or even be traps, and Trickery are all political cards. You can buff/debuff players or even make deals with them in certain instances. You’ll draw cards at the beginning of your turn and you can draw from any combination of three decks until you’ve filled your hand back up. Where Armello truly shines though, is playing in on the couch with your friends. There is a lot of potential for actual instances of political subterfuge that I can’t help but to unleash on my friends. It’s just so much fun to make treaties, packs, deals, and more with people you actually know and can directly communicate with them during a session. Another highlight was how visually appealing and artistic Armello truly is. The cathartic art looks like it could have been straight out of a Studio Ghibli film. Every time I saw a new card I was impressed with the detail in the artwork and animations. The actual 3D models and textures were beautiful too. However, if you thought the art stood out, the soundtrack is something on a whole different level. Amazing orchestrated works accompany the on-screen action and bring out a deep passion from the developers on creating the title. My only main gripe with Armello is that despite how many options you have for achieving victory, most of the time it’s the character with the highest prestige that’s going to win. The king is incredibly hard to defeat in combat, especially without dying yourself and it takes a lot of time to gather four spirit stones, and even then you have to actually make it to the king. There aren’t any cards that affect the king’s health either, so you can’t make the matches last longer in order to give yourself more time. Overall, Armello is a great virtual board game that you can tell the developers put a lot of effort to craft and balance the rules fairly. This is the type of game that is fun in a sort of conniving way of making or breaking alliances with your friends in order to achieve your own goal. If you like board games and have friends to play with, Armello is easy to recommend and enjoyable across the board.